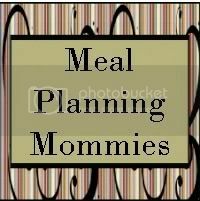 Life as we know it. : Ice cream! 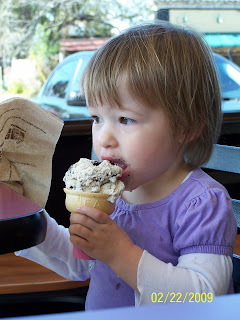 The kids had their first ice cream cones last weekend. We went to the park and afterwards we walked to Baskin Robbins. The kids sat in their chairs like big kids - ice cream helps that! I chose chocolate for Savannah. Big mistake on my part. She is very messy at all times. Thankfully, I am now a pro at removing stains. Move aside Kate Gosselin, there is a new stain remover in town! napkin. Eventually, Savannah and Sophia made a swap. 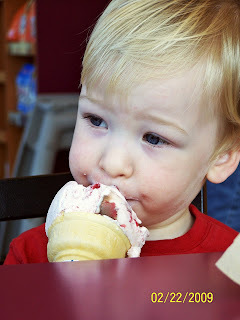 Since Tristan loves - I do mean loves-strawberries he got strawberry ice cream. I think he liked it. What do you think? 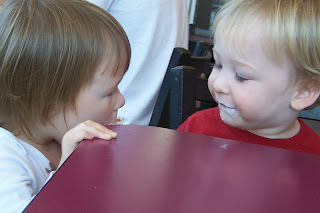 After Sophia finished her cone, Tristan shared his ice cream with Sophia. He is t ruly a great big brother. He adores his sisters. So cute! 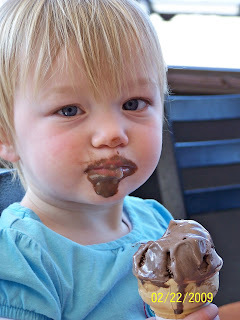 And so brave with the chocolate ice cream. 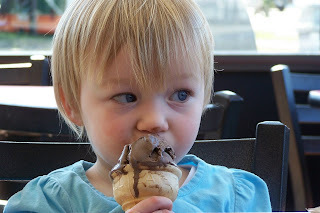 I wish it were warm enough here for the park and ice cream. 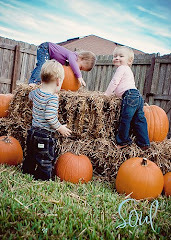 Oh how cute :) I can't wait to try things like that with my beebs.